SommTable is Barndiva’s way of extending our definition of farm to table - eat the view - to drinking it. We think of the SommTable as a salon, a place where we gather to drink, and talk about wine with a particular point of view. Where we can host evenings with winemakers we know and admire, or haven't met, but want to know. 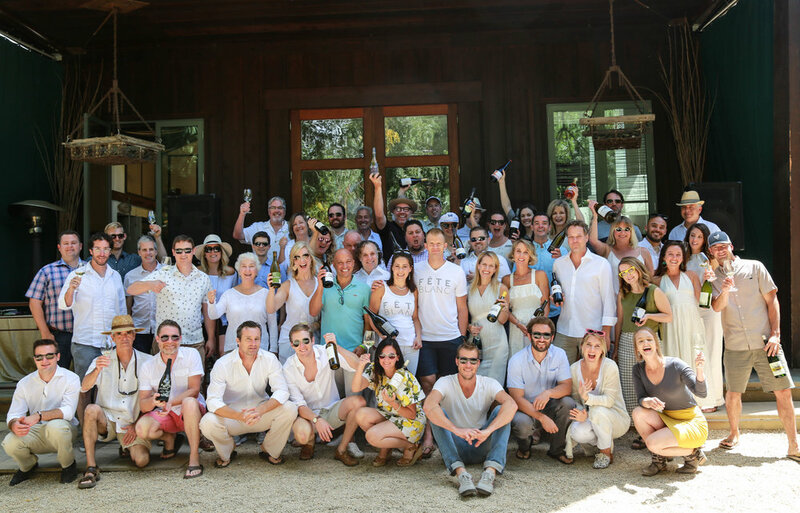 Throw seasonal garden parties like The Pink Party, Féte Blanc, and Féte Rouge, with winemaking friends. There is an actual table, forged by Jordy Morgan, where you can have a singular interactive experience with a glass of wine, host a small dinner party, or just kick back with friends. SommTable is a monthly conduit to winemakers we admire and some of their library wines we currently feature in both restaurants. (For Winemaker of the Month, see below). But really, SommTable is actually more of a state of mind. We’re going to put a lot of what we love and believe in out there, and see what sticks. Let’s see where the conversation takes us. Starting with a part-time job as stock boy at Bell’s Wine Shop in Washington, DC followed by a ski season in Aspen as sommelier and manager of a local restaurant, Ehren finally made his way to California. That is where a temporary job as a tour guide at Joseph Phelps Vineyard introduced him to Bruce Neyers and three years later presented him the opportunity of a two-year apprenticeship with Jean-Luc Columbo in the Rhône Valley. His return to California led to winemaking opportunities at Neyers Vineyards and Turley Wine Cellars. Along the way Ehren purchased a plot of land out on the rugged Sonoma Coast (Cazadero to be specific) and planted it to Chardonnay and Syrah. Shortly after, he founded Failla Wines (1998), marked by the release of Alban Vineyard Viognier and Que Syrah Syrah. Failla has since added numerous cool-climate vineyard sources to their bottlings and in 2011, Ehren added to his vineyard holdings with the purchase of the Olivet Vineyard. Located in the “middle reach” of the Russian River Valley, this vineyard gives him another 14 acres to farm as he sees fit. Ehren’s viticultural training in France has forever infused his hands-on farming practices and his minimalist hands-off winemaking choices, ideals that have allowed him to coax out the various incarnations of his favorite varieties from different climates, soil types, and rootstocks. Inspired by Pinot Noir, Chardonnay and Syrah, Ehren has molded relationships with great farmers and added to his estate holdings and plantings (30 acres) to produce bottlings that capture the essence of California's finest regions. Here at Barndiva we love sharing exquisite wines from fantastic producers. Each month we highlight one winery that we particularly adore. For the month of April, we are honored to be able to offer exclusive access to a very special allocated selection of library Chardonnay, Pinot Noir, and Syrah from Ehren Jordan's Failla. Whether by the glass, or by the bottle, come enjoy these meticulously farmed wines while you 'eat the view'. Tickets for Fête du vin Blanc 2019 on sale now! Eat the View Blog Post December 12, 2014 "Our Cup Runneth Over"
Eat the View Blog Post August 12, 2016 "Celebrating Excellence"
Eat the View Blog Post November 24th, 2016 "Introducing The Somm's Table"